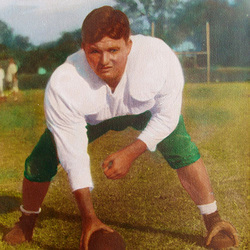 Harvey James loved to meet people face to face, especially if they were wearing the uniform of an opponent and had taken a position a yard in front of him. James' brilliant Hurricane football career started in 1940 but didn't conclude until 1947 because of World War II. In between earning letters in football in 1941, 1943, 1946 and 1947 he also lettered in basketball and baseball in his senior year. James was a sure bet to be named the starting center for the Hurricanes in 1942 but WWII changed his uniform, during his military training in 1943 he attended and played and lettered for the Hurricanes. Came the end of the war and most service men had returned by the end of 1945 but James wasn't able to return until 1946. He was so highly regarded that he was given All-American treatment and he might well have made it but UM had just moved from the Little All America rating to the big time and UM just didn't have the status to give James the push he needed. Many opposition coaches and players were surveyed and all said Harvey James was the best Miami player they had faced. After his graduation he signed with the Cleveland Browns where he played several seasons. Before entering private business James also was an assistant football coach for the Hurricanes and he was the head coach for the UM freshman football team.